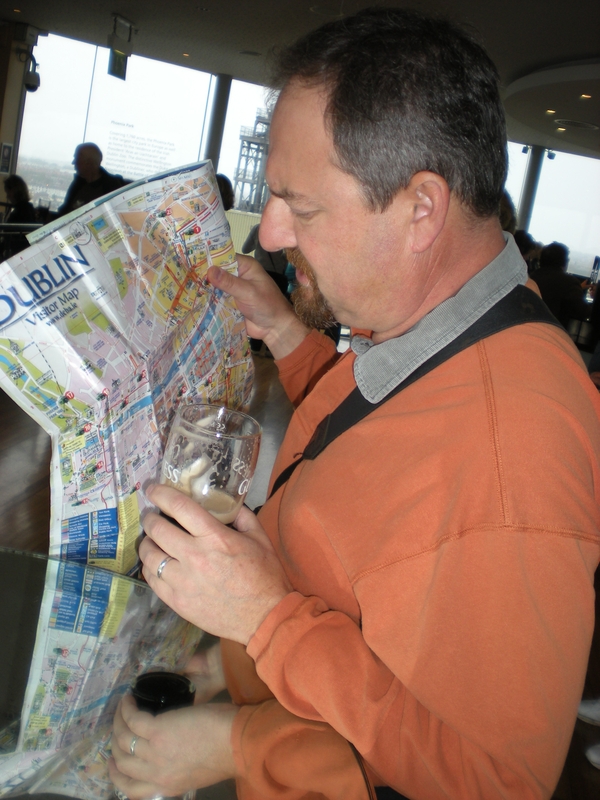 Day 3–We were supposed to go to Kilkenny but misread the Sunday train schedule and decided to stay in Dub one more day. Besides, we had a lot more to see. 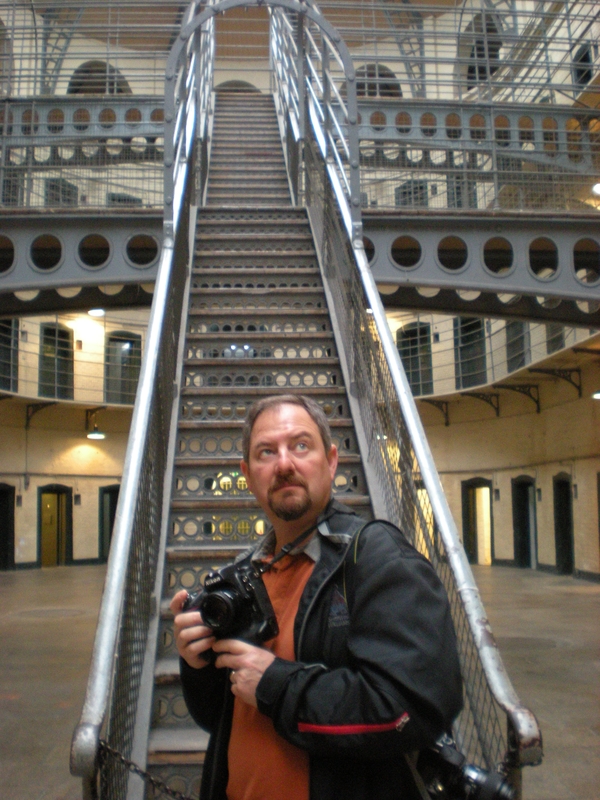 Our first stop was the Kilmainham Gaol which is probably one of the most infamous prisons on the island. Most, if not all, of the Easter Uprising main players spent time here or were executed here. This includes Michael Collins (Liam Neesam played him in the movie of the same title). This was a very interesting tour. The next stop was the Guinness Storehouse tour. This is interesting only for the 360 degree view at the top of the Gravity Bar where they pour you a pint of Guinness with your entrance fee voucher. If you’ve ever toured a brewery, this is basically the same drill, zip through the info and get to the free tasting room. It being Sunday most of the town lay in slumber till past noon. Only the stoutest (pun intended) old-timers were in the pubs having a pint. We know this because we were some of this old timers. 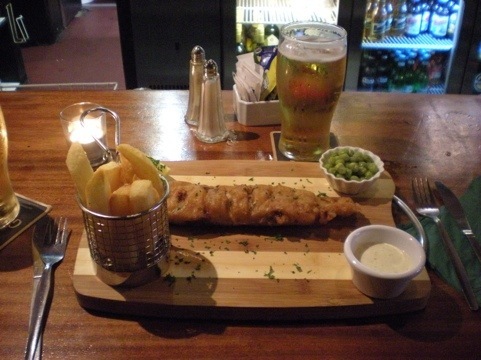 We visited The Brazen Head Pub, est 1198, and had a pint with some pub grub. Live Irish music, a labyrinth of rooms and stairs and a great setting for getting a Guinness in you. From there we visited O’Shea’s Pub across the street. This was actually a little more fun because the bar tender was very friendly. 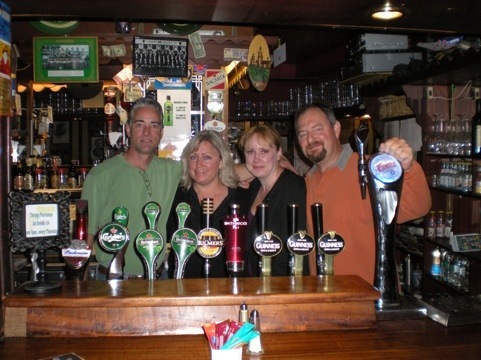 He let us go behind the bar and take pictures, talked our ears off about where to visit in Ireland. This brings me to a point about friendliness in Ireland. Having traveled all over the world I cannot recall a friendlier town or people. It’s as if they all go through some sort of customer service training in school. They are happy to give you directions (in minutes not distance), happy to give you advice, happy to let drop a few Irish tales and fables 24/7. Being the personal space-bubble conscience-minded Americans this can be somewhat disconcerting at first. You think they are just buttering you up to rip you off or steering you into a back alley to mug you. Not the case at all. I fact, every cab driver rounded down the fare and said tipping was not necessary. Hey New York, come on over and learn something. So at this point we’ve knocked back several pints and are feeling a little happy. Jet lag is still getting the better of us so we all decide to call it an early night since we are starting this three-day tour of the western part of the Island at 6:40am. But, that damn Oktoberfest is so close to the hotel we are drawn to it like a fruit fly to wine. We give it a try for a few minutes and a foot-long bratwurst. Wouldn’t you know it that as soon as we get a beer, wurst and schnapps the “oompa” band starts a rollicking rendition of Sweet Home Alabama. I’ve never been to Alabama but who can’t start feeling nostalgic at those first few bars of that song? We sardine ourselves into a few spaces on a bench full of drunken festers and realized we were sitting next to a group of deaf girls. During one song everyone seemed to know the words except us, Letty asked the girls what song this was. This was quite comical since they shrugged and mouthed the words, “Hey, we’re deaf. We don’t know what a song even sounds like.” I think that’s what they mouthed. I couldn’t hear them. Posted by pubspeopleplaces on September 26, 2011 in PLACES and tagged abroad, beer pub, brazen head pub, Dublin, Gaol, Guinness, Ireland, o'sheas pub.